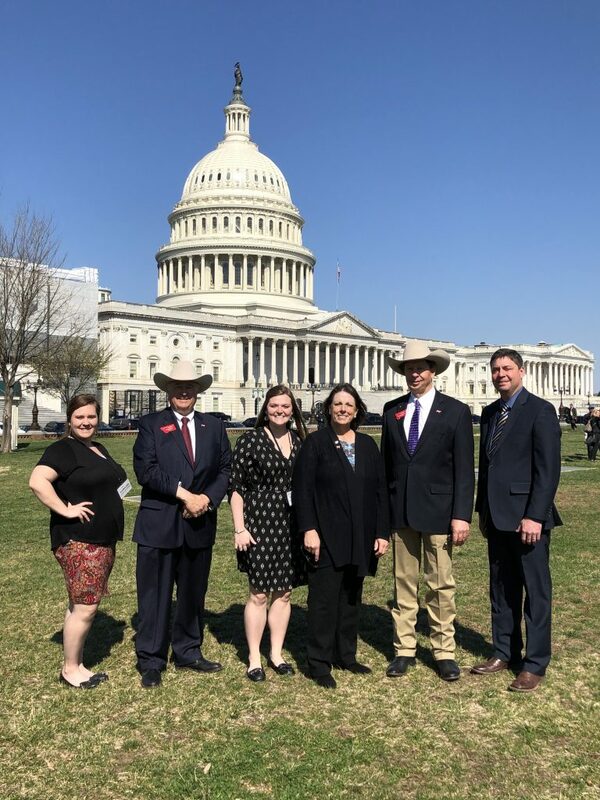 (HELENA, MT) The Montana Stockgrowers Association traveled to Washington D.C. last week to meet with Montana’s Congressional Delegation and advance policy priorities of Montana’s ranchers. The Association’s priorities included advancing international trade for Montana ranchers, finding a permanent solution for Electronic Logging Devices for agricultural haulers, increased research for brucellosis, and promoting an industry-led Country of Origin Labeling program. President Fred Wacker was joined by First Vice President Jim Steinbeisser of Sidney and Second Vice President John Grande of Martinsdale for the trip. The officer team from MSGA met with Senator Tester, Senator Daines, and Congressman Gianforte in addition to agency meetings with the Department of Interior, Department of Commerce, Environmental Protection Agency, and the Department of Agriculture. To learn more about the Montana Stockgrowers Association and their work on behalf of Montana ranchers, please visit mtbeef.org. The Montana Stockgrowers Association, a non-profit organization representing nearly 2,500 members, strives to serve, protect and advance the economic, political, environmental and cultural interests of cattle producers, the largest sector of Montana’s number one industry – agriculture. L – R: Karoline Rose, President Fred Wacker, Tayla Snapp, ANCW President Wanda Pinnow, 1st Vice President Jim Steinbeisser, Executive Vice President Jay Bodner.